Technical analysis is the art or science of forecasting future prices based on what happened in the past. Nowadays, it is easier for anyone to open a trading account with a broker, and the next thing you know, traders have access to a chart. Back in the days when personal computers didn’t exist, charting wasn’t that easy. Today, with a single mouse click, traders plot complex trend indicators or oscillators on a currency pair and on different timeframes. But have you ever wondered how technical analysis started? Traders became curious and started to document patterns they seen continually forming on the market. The “playground” was the stock market in the United States, and maybe some commodity markets that traded at that time (first half of the 1900’s). The so-called classical technical analysis patterns were born in those days. The head and shoulders and the rising and falling wedges, ascending and descending triangles, and even double and triple tops and bottoms, they come from the curious minds of technical traders. Major trading theories have emerged from the same years. The Elliott Waves Theory, the Gartley method…they both have roots in the middle of 1950’s. Fast forward to 2018, and we see financial markets not dominated anymore by human actions, but by robots. About eighty percent of all trading takes place automatically, with robots or trading algorithms buying and selling when the market matches specific conditions. With the rise of Artificial Intelligence (AI), what would the future of trading be? The very same classic patterns mentioned above, don’t work anymore as they used to work almost a hundred years back in time. Programmers instruct trading algorithms to spot classic technical analysis patterns, and then to push the price the other way, until the invalidation. The automated trading is one explanation. Another comes from the increased technology, and the time it took for a trade to be executed than when compared with current times. The oldest way of looking at a chart, price action tells much about the future direction, without the need of an oscillator or other fancy indicators. In fact, merely some candlesticks, support and resistance, basic trendlines, channels, market geometry and basic patterns to recognize consolidation areas will do the trick. The best way to illustrate how price action functions is to take a chart, any chart, of any currency pair, and study it. Here’s the USDCAD daily timeframe. Since January 2016, the pair moved in a bearish trend, falling from over 1.46 to almost 1.20. From left to right, here’s how to interpret this market from a price action point of view. The pair dropped in a nearly vertical line, and until a meaningful bounce comes, there’s nothing bulls can do. It is as trying to catch a falling knife, which is not a sound trading strategy. When strong trends like this one form, traders wait for the market to break the previous series of lower lows and lower highs. That’s when the trend reverses, and it shows either a new trend or a correction of the previous one. Moreover, the confirmation point comes when the market starts a new series in the opposite direction. In this case, the key is to identify a series of higher highs and higher lows. After the market confirms the new series, traders look on the left side of the chart to market the horizontal support area. Next, they drag it on the right side to see what the price does when/if it meets the area. To draw a trendline, all you need are two points. From two points, the new-drawn trendline provides future support and resistance level. In this case, the first point is the start of the new trend/correction, and the second higher low. Dragging the trendline on the right side of the chart offers dynamic support and resistance. However, be cautious: the more the price has the power to come to the trendline, the weaker the trend becomes. Eventually, the trendline will give way. The blue line shows the main trendline, and the next two times the price test it, traders go long. What’s the target? The idea is to copy/paste the main trendline on the top of the second higher high. This way, a bullish channel results. It isn’t mandatory for the price to reach the opposite side of the channel, but when and if it does, that’s no place to stay long anymore, as the price meets dynamic resistance. Moreover, after the second entry, the market makes a double top formation and then comes back and breaks the main trend line. That’s bearish, suggesting new lows. In a pure automated trading style, the market makes a new high tripping stops, before reversing and breaking the original support level. The same principle explained so far applies to current prices too. The pair fell in an aggressive trend, and then, suddenly, the bearish series stops and a bullish one begins. Projecting the levels the same way as described earlier leads to an almost identical situation. The focus now shifts to what the price will do when meeting the grey, horizontal line. Depending on the moment it tests it, the rising blue dynamic support may offer a hand, it the entire area suddenly becomes a confluence area (two or more support levels exist in the same place). 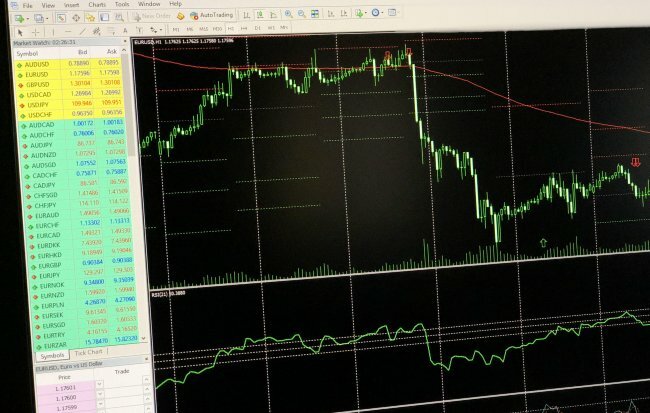 This article aims to show how interpreting price action works and how to find potential trades by just looking at candlesticks and interpreting levels. Traders did the same back in time when no personal computers existed: they used hand-made charts to draw levels and then try to buy or sell at dynamic or classic support and resistance levels. Price action strategies work well if combined with Japanese candlesticks techniques too. Moreover, they set the room for remarkable risk-reward ratios.